Hello! Today I have my design for June's 'Splash' MeeBox to show you. As I said last month, I want to make sure I post both swatches and a nail art design for each box. June's theme was 'Splash' - you can see my unboxing here, and my swatches of the polishes here. 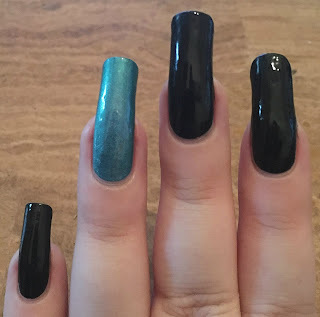 I used all of the items we received for my mani below. Read on to find out more! To begin with, I painted my ring finger with A-England 'Whispering Waves', and all others with Pretty Serious Cosmetics 'Absence'. Both are shown below with topcoat. I then applied Mini Mani Moo 'Mess No More!' liquid latex to all of my black nails. It was so ridiculously hot in my flat that the latex dried as I was applying it. It looked a bit lumpy but still peeled off nicely and protected my skin just fine! 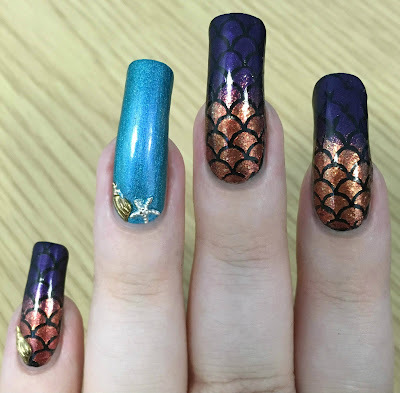 To create my mermaid scales, I used the nail-mail.co.uk full nail vinyls. I found that the quicker I pulled a vinyl off of the backing, the more 'scales' stayed behind. I then used tweezers to separate any that remained. I applied a vinyl to each nail except my ring finger. Using a make-up sponge, I then applied a gradient of both A-England 'Gloriana' and 'The Blessed Damozel' over each vinyl. This didn't work out quite how I had planned. The red base of 'Gloriana' was covered by the dense gold flakes, and 'The Blessed Damozel' was a bit too dark against the black base - but I carried on anyway! I finished off by adding a couple of She Sells Seashells charms to my ring and pinky fingers, before sealing everything in with topcoat. What do you think? Even though it didn't quite come out as I'd pictured it, I still quite like it! I accidentally managed to come up with a slightly more unique design. I'm also quite proud that I used every single item from June's box, and with the exception of my black polish, nothing else. I am loving this manicure. The gradient is fantastic! This is so gorgeous! I love the dark mermaid vibe! Wow! What a fun design! This is a fantastic sea-worthy nail design. 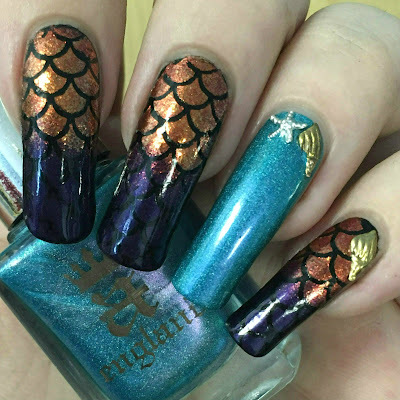 Your long nails really show off the gradient for the scales so well. This fishtail design is so gorgeous. 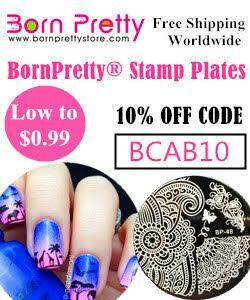 I'm so looking forward to trying those stamps on my nails. I have a hobby to make different designs and beautiful nail arts and use http://nailartstyle.com/top-70-colorful-nail-designs . Where do you get your ideas? love the dark fish tail. gorgeous mani!